Set in a private nature reserve spread over 1,000 acres of Central America's last remaining lowland tropical rain forest, Lapa Ríos overlooks the pristine point where the Golfo Dulce meets the wild Pacific Ocean, making it the destination that matches every one's idea of paradise. Lapa Ríos was built by John and Karen Lewis as a private nature reserve. A Minnesota couple driven by a vision, John and Karen liquidated all their assets to finance the purchase of a large tract of rain forest and to build the small supporting tourism project. Lapa Rios was designed in harmony with the surrounding forest and beach environment. The main lodge and bungalows line three ridges and are connected by walking paths and steps. Built over 350 feet above the sea, Lapa Rios catches the cooling tropical ocean and forests breezes. The main lodge, housing the restaurant and bar, soars 50 feet and is built of local, natural materials. Palm thatched roofs meet a three-story hardwood circular stairway. Climb to overlook the forest canopy and breathtaking ocean vistas. Comfortable, locally made bamboo furniture adds to relaxation in this tranquil panorama of nature. 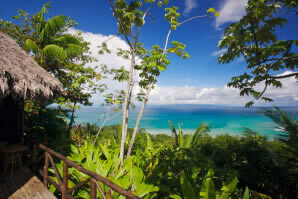 All 16 thatched bungalows have an ocean view and are surrounded by the rain forest. Guests feel part of the outdoors as constant tropical breezes pass through screened window walls. Each bungalow features a private deck and patio garden, complete with an outdoor shower. Interior shower baths are tiled and two washbasins are set in Cristobal wood, matching the polished floors. Two queen-size beds are draped with mosquito netting. A private, romantic setting. In Lapa Ríos you will find luxurious accommodations in the bungalows, international cuisine and a kind, outgoing staff. Combined with this comfort Lapa Ríos offers a wilderness adventure few ever experience. Lapa Ríos is part of the Golfo Dulce Forest Reserve, the same forest as nearby Corcovado Park. Miles of private, uncrowded trails in prime rain forest, cool rivers wild with waterfalls and pools, and unspoiled, safe sand beaches. All tours use trained naturalists for guides. Lapa Rios is an ideal vacation for people who enjoy adventure in nature and want to be a part of conservation and local culture (often called Geotourism). The majority of guests are active couples, honeymooners and families (children over 6 years) looking for a more active and uniquely personal experience. Come be a part of ecotourism at Lapa Rios, become a traveler who participates in real sustainable tourism. Visit Lapa Ríos and experience a wilderness adventure in a class by itself... in the rain forest of Costa Rica. Lapa Ríos is striving to be a model demonstration of responsible eco tourism. Lodging in private deluxe bungalow. Selection of on-site guided tours such as: Early and Sunset Birds Tour, Wild Waterfall, Local Medicine Tour, Rainforest Ridge Walk, Osa Trail, Matapalo Tour and Night Walk. * Rates are in US Dollars, per person, per night. Children under 12 years of age are required to pay the specified Child Rate. Children 12 years and older pay full rate.